Can Geely become a worthy owner of the Volvo brand? SHANGHAI -- How can Geely, a young Chinese company making cheap cars, revive a troubled global premium brand like Volvo? This question, I believe, flashed into the minds of many people in the industry last week after Ford confirmed Geely as the preferred bidder for its Volvo unit. I, too, am unsure of Geely's ability to manage a global marque. But I am willing to give Geely the benefit of the doubt as I believe it has a better chance of turning Volvo around than other contenders. Geely released a statement last week, promising to maintain Volvo's existing plants, r&d centers and dealership networks, and keep its agreements with labor unions. It has also pledged to allow the brand to be run by an independent management team based in Gothenburg. But many industry observers still fear that instead of reviving Volvo, Geely's low brand recognition in and outside China will tarnish the classic brand. Such concerns are unnecessary for two reasons. 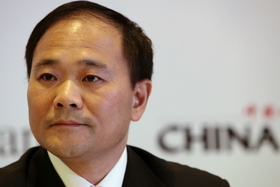 Geely boss Li Shufu has worked hard to boost his company's brand image in China. First, I think Geely's president Li Shufu knows how important brand value is to an automaker. That's because he knows how hard it is to build a brand. After a decade of consistent and strenuous effort, Geely is still perceived as an inexpensive brand in China, and still has difficulty penetrating major cities such as Shanghai and Beijing. In fact, it was Li's deep appreciation of Volvo's high brand value that prompted his company's bid. Because of this, I believe Li will do all he can to avoid associating Volvo with Geely's existing brands. More than this, the main reason I think Geely will be a worthy owner is that the Chinese company is well placed to leverage the domestic market to revive Volvo. According to Ford's latest financial report, Volvo's pre-tax operating loss was $135 million in the third quarter of this year, compared with a loss of $458 million for the same period in 2008. The improvement was mainly achieved through cost reductions. Cost cutting alone cannot return Volvo to profitability and restore the position it used to enjoy on the global market. The brand needs a big market with a strong appetite for its products to boost sales. China is such a market. In the first three quarters of 2009, passenger vehicle sales in China surged by 30 percent from the same period last year. Chinese consumers see Volvo as a respectable brand. Given the dangerous state of China's roads, its reputation for safety is highly regarded. Yet, because Ford only builds two Volvo models in China, the Volvo S40 and the Volvo S80, the brand now only commands a tiny 0.3 percent of the market here. So there will be a lot Geely can do for Volvo in China. As a well-run and well-connected private company, Geely can quickly put more models into Chinese production. Due to insufficient investment from Ford, Volvo has long been marginalized, both in the global market and within China. Ford's decision late last year to put Volvo up for sale has exposed the brand to even more uncertainties. Now that Ford has chosen Geely as the winner of the initial round of the bidding for Volvo, it is time for the two companies to move fast, deal with remaining issues and conclude the deal. Ford would do well to allow Geely to end Volvo's damaging period of uncertainty, and move on to a new era in which it can re-establish itself as one of the world's most successful premium marques.